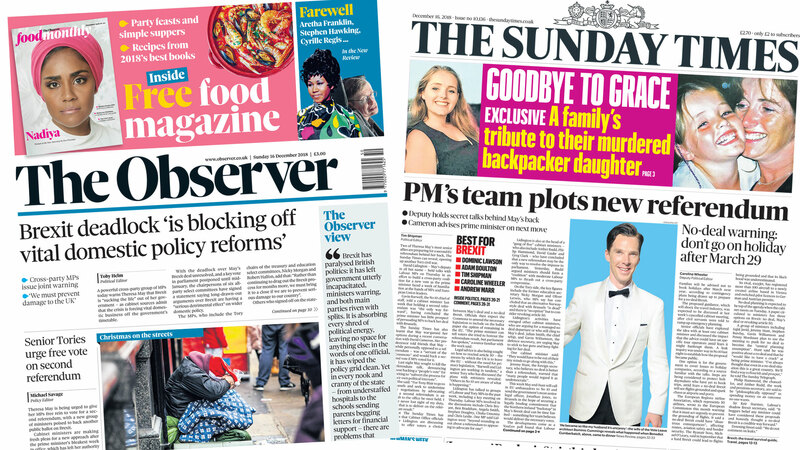 Image caption Reports of ministerial pleas for a second referendum on Brexit make Sunday’s front pages. The Observer says the PM is being urged to give MPs free rein to vote for another public ballot. The paper also reports that a cross-party group of MPs have warned Theresa May that Brexit is “sucking the life” out of her government and is “blocking off vital domestic policy reforms”. Image caption “PM’s team plots new referendum,” is the headline on the Sunday Times. It says two of Mrs May’s most senior allies – David Lidington and Garvin Barwell – are preparing for a second EU referendum behind her back. Meanwhile, Mrs May sought to kill the referendum talk, denouncing those backing a “people’s vote”, it reports. Image caption The Sunday Telegraph leads with comments from Foreign Secretary Jeremy Hunt, who says the UK will “flourish and prosper” even without a Brexit deal. He also tells the paper he wants “a crack” at succeeding Mrs May, following her pledge to stand down before the next election – due in 2022. Image caption The Mail on Sunday reports that some BBC executives have been awarded annual wage rises of up to 30%. It says the pay hikes come as the corporation considers scrapping free TV licences for those over 75. Like a number of the front pages, it features a picture of Strictly winner Stacey Dooley and her dance partner Kevin Clifton. Image caption The Sunday Express says the Centre for Social Justice has criticised NHS documents that have replaced “fathers” in their antenatal guidelines with “birthing partners”. The NHS dismissed claims that is is pushing away fathers, the paper reports. Image caption The Daily Star Sunday says a baby is will be home from hospital in time for Christmas – after cheating death three times. It reports that Layla Daly spent 115 days in hospital. Image caption “Harry to snub Boxing Day shoot for Meghan,” says the Sunday Mirror. The paper reports that the Duke of Sussex will miss the pheasant shoot out of respect for his wife’s principles. Image caption “My 32 years of hell after daughter’s killer tried to frame me,” is the Sunday People’s headline. The paper has spoken to the father of one of the Babes in the Wood murder victims, who says his nightmare goes on despite his daughter’s killer being sentenced this week. Gary Lineker row: What can BBC presenters say and not say?